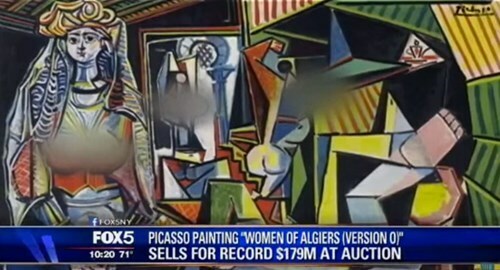 Pablo Picasso’s “Women of Algiers (Version O)” was making headlines this week when it sold at Christie’s for a whopping $179 million, making it the most expensive painting ever purchased at an auction. Fox5 in New York also reported on the news, and one of their producers decided to blur out all the b00bs in the image, infuriating many people online. Jerry Saltz, senior art critic for New York Magazine, pointed out the unnecessary censorship on Twitter Wednesday. And others also criticized the station for bizarre editorial decision. The hosts of Fox 5’s morning show “Good Day New York” did a segment on the controversy Thursday, in which they showed the uncensored piece, calling themselves “art connoisseurs” and blasting their coworkers who made the unfortunate decision.